Porcelain dolls are typically made out of china or bisque material, giving them an ivory, translucent appearance. Porcelain dolls originated in Germany, Denmark and France in the early 1800s and became popular once doll manufactures were able to mass-produce dolls near the end of the 19th century. Porcelain dolls continue to be made and are prized by collectors today. There are a few ways to identify a porcelain doll. Look for dolls with a glazed appearance to the porcelain, giving the exterior of the doll a slightly shiny look. This is a china porcelain doll and is a common feature of antique porcelain dolls. Find dolls with an exterior that appears soft and slightly dulled due to an unglazed finish. These dolls are referred to as “bisque” porcelain dolls. This material was frequently used for antique dolls as well and is still commonly used in the creation of porcelain dolls due to the closer resemblance of human skin. Evaluate the clothes in which the doll is dressed. The fabric, trim and style of the clothes should be representative of the era in which the doll was made. Although some dolls and some doll clothing may be reproductions and not original antiques, the fashion should remain representative of the time period. Identify an early porcelain doll by a head made out of bisque or porcelain and a leather or cloth body. Early makers of dolls included Bahr and Proschild, the Heubach family, William Goebel and Bru Jne and Cie. While not all antique porcelain dolls are marked, those that are usually have the marking on the head, on the base of the neck, on the back, shoulder, legs or feet. An example of a maker’s mark is a crown with an entwined W and G, as found on a William Goebel doll. Look for information identifying the doll as a modern porcelain doll, or one that was manufactured after 1980. Some modern manufacturers include Avon Fine Collectible Dolls, Sweet Dreams Collection Dolls and Victorian Star Collection Dolls. Modern porcelain dolls are more likely to bear a maker’s mark to identify the company that made the doll. 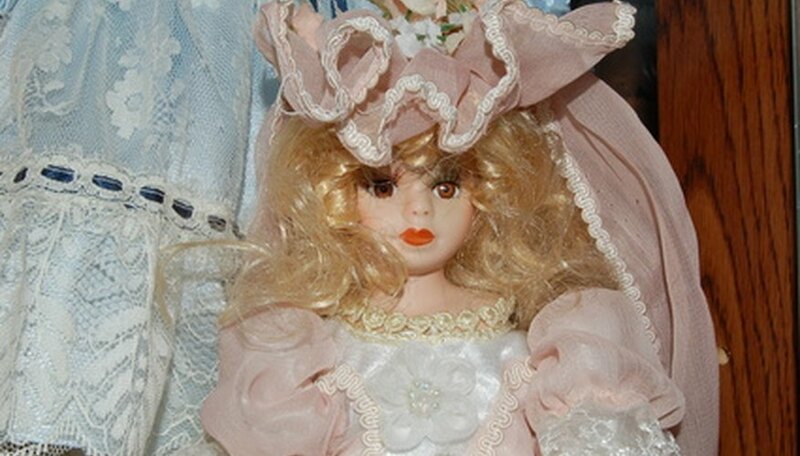 Learn about individual doll makers, identifying characteristics and photos online at websites such as DollReference.com or in reference books such as “German Porcelain Dolls, 1836-2002” by Mary Gorham Krombholz. How to Tell If an American Girl Doll Is Pre-Mattel?